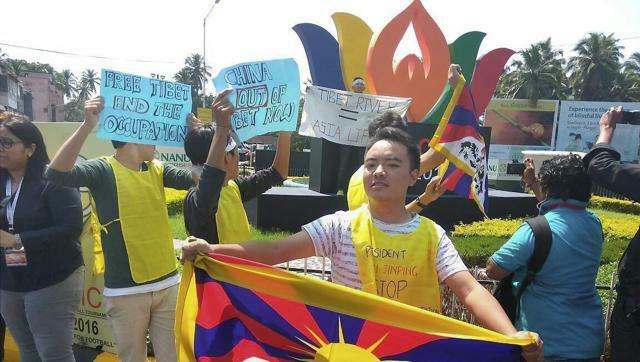 (TibetanReview.net, Oct16, 2016) – Police in the Indian state of Goa took into custody on Oct 15 around 100 Tibetans as they protested against Chinese President Xi Jinping who arrived to attend the 8th BRICS summit at Goa’s commercial and cultural capital Margao. The incident occurred at around 12:30 pm as the Tibetans – all activists of the Tibetan Youth Congress (TYC) – gathered at Margao Circle, one of the busiest intersections of the city, shouting slogans such as ‘Free Tibet’, ‘Stop the demolition of Larung Gar’, and ‘Stop killings in Tibet’ while carrying placards reading ‘Free Tibet and end the occupation’ and ‘China OUT of Tibet now’. Those taken away included the TYC President Mr Tenzing Jigme and Secretary Mr Penpa Tsering. Margao is located 15 km away from the heavily fortified coastal villages of Mobor and Cavelossim, the venue of the BRICS summit. “Today we are here to demand Xi Jinping to end the illegal occupation of Tibet and we also want to highlight the current demolition of Larung Gar Buddhist Academy where thousands of Tibetan monks and nuns are being displaced against their will. The world needs to hear this”, Tenzing Jigme earlier said in a statement. Larung Gar is a sprawling Buddhist learning centre with more than 10,000 student monks and nuns not only from across Tibet but also mainland China and other countries. China began demolishing residences on Jul 20 and carrying out expulsions so as to reduce the centre’s student-strength to a maximum of 5,000. All the Tibetans who had gathered to protest outside the luxury resort where Chinese President Xi Jinping was staying were taken away. The Goa police were on a lookout for Tibetans eight days prior to the summit, reported goanews.com Oct 15. And it began with a group of Tibetan monks being arrested by Goa police in Margao city on Oct 12. The monks were released by court on condition not to enter South Goa district. The report said this was followed by the arrest of 11 students on Oct 13 and 20 students on Oct 14 as a preventive measure. They were later released by the court on personal bonds and with a similar condition not to enter South Goa. While TYC said all the around 100 protesters on Oct 15 were detained, PTI news agency Oct 15 quoted Margao Police Inspector CL Patil as saying, “A total of 43 Tibetans were arrested in the town where they were protesting. They will be produced before a local court later in the day.” The report said the protest at Margao caught the police unawares. AP Oct 15 cited police as saying the Tibetans would be released after a few hours. Xi landed at Goa’s Dabolim airport and was welcomed by Indian Prime Minister Narendra Modi who wrote on Twitter: “India is delighted to host President Xi Jinping for the @BRICS2016 Summit. May his visit further strengthen India-China relations. headed straight for the BRICS Summit venue.” Modi was to hold bilateral talks with Xi at 5.30 pm.